Venture Crew 45 meets every other Sunday from 2-5 PM. We are active in shooting pistol, rifle, and shotgun. 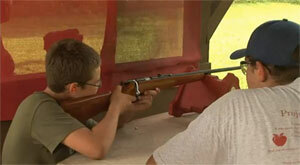 Our goal is to teach the safe and proper way to shoot, and have fun in the process. Recruiting youth ages 14-21 for a shooting sports focused Venture Crew. Also looking for adults to serve as advisers for the crew. Anyone who is interested can contact us at Visit venturecrew45.org or Crew45Dillon@gmail.com.